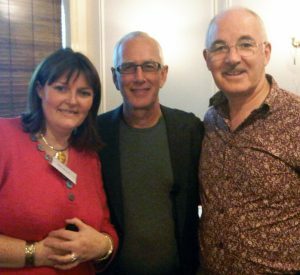 I have been lucky enough to train with some great names in hypnotherapy, Michael Yapko (at least three times), the late Gil Boyne and the legendary Ormond McGill amongst others. They all passed great wisdom and techniques on to me that served me well in my 18 years of practice. However one course I attended in Newcastle, England, sticks out in my mind. I had the distinct privilege of attending Bill O'Hanlon's "Geography of Possibilities Workshop" course way back in 2010. Bill is a very gifted trainer and practitioner of Neo-Ericksonian Hypnotherapy and one of a select band of privileged therapists able to train with Erickson personally. Dr Milton H Erickson is probably the most famous hypnotherapist in the world. A poor student at the time, Bill couldn't really afford to train with the great Dr Milton H Erickson. So Erickson cut him a deal. Milton was by then wheel chair bound with a very extensive desert garden to tend to in his home at Phoenix, Arizona. Bill agreed to be his temporary gardener in part payment as he trained with the great Erickson. There is little doubt as well as learning at the feet of "the man" during his formal training, Bill gained unique access to Erickson. Much insight and wisdom was learned in the relaxed and informal setting of the garden. This is where Bill had the opportunity to approach the great Erickson and gain therapy nuggets that no other student could access. I personally recommend Bill O'Hanlon's books and media to all my students as he has a very deep understanding of the techniques and wisdom of Erickson. As a trainer Bill is one of the most genuine, unassuming individuals you are likely to meet in the field. During my training with him he broached the subject of clients who just like the rest of us have unique habits or mannerisms that serve them well at one level, but others in their circle might find unsettling. Behaviour modification is a goal of therapy, but some harmless mannerisms or behaviours marked these people out as individuals (yes a little quirky or odd by some subjective standards - but hey, who is to say?). Anyway Bill realised that some clients reneged against changing these mannerisms, which objectively, hurt no one. Instead suggesting rather than modify them to the unwarranted desires of others around them, they not only keep them, but celebrate them as well. So when I encounter clients who tell me others think they are a bit strange or weird (and remember that can be as harmless as practising Buddhism, being a vegetarian or having a unique hobby or pastime) I just commend Bill's therapeutic approach to them...Celebrate your Weirdness! Personally I find these individuals colourful, they brighten up a rather monochrome and uniform world for me. If I had to choose between boring and predictable or a little weird I know what peg I would hang my coat on, but hey I am a hypnotherapist and we all know how weird they are. So until the next time, go placidly and celebrate your weirdness, be it big or small.